Click HERE for latest news and photos of our Little Stars in the forest! Little Stars Nursery have five qualified Level 3 Forest School Leaders with enormous enthusiasm for the magic and wonder of the outdoors! The Forest School team regularly take small groups of nursery children out into our fantastic woodland spaces where they are able to explore and discover nature. Forest School Leaders are experienced in supporting learners through a range of experiences which are simple and achievable, helping to nurture their confidence and self-esteem as well as teamwork and independence skills. Children love the excitement of Forest School and safe risk taking is encouraged. Learners have the opportunity to try something new - build a den, hunt for bugs, make mud pies in the mud kitchen, create art in nature, go on storytelling adventures, climb trees, use tools and even experience cooking on an open fire - it's what Forest School is all about! 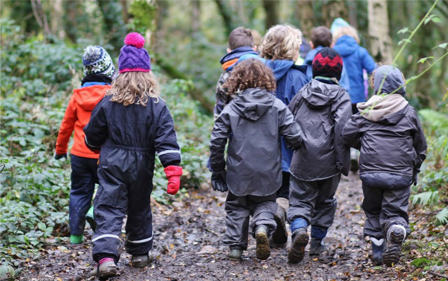 Forest Schools Leaders carry out a woodland risk assessment prior to every Forest School session and fully risk assess all Forest School experiences to ensure children are safe and are able to enjoy and achieve.